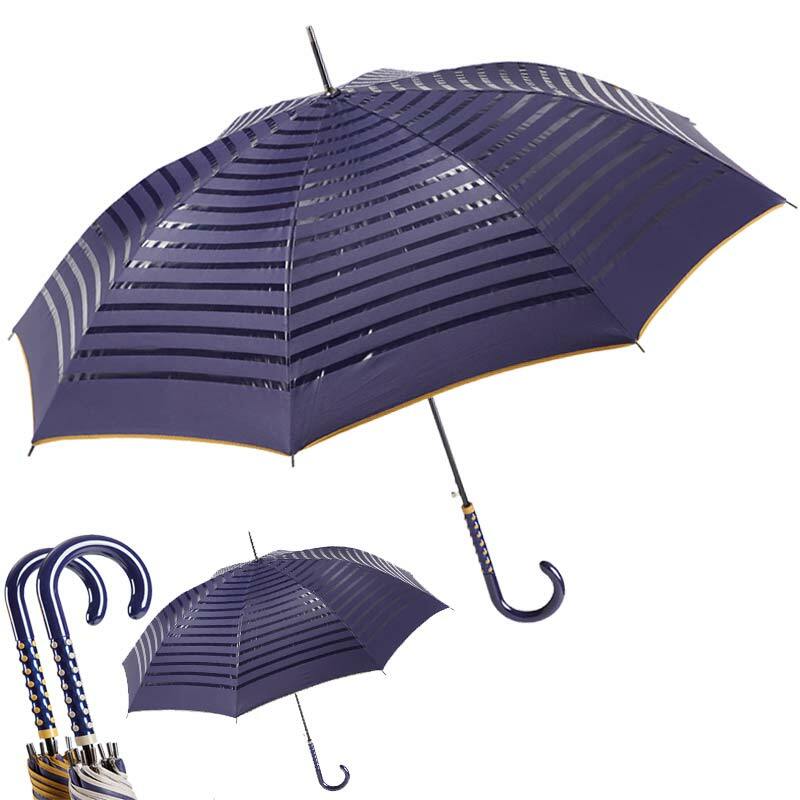 Ezpeleta 2 Tone Striped Double Sided Umbrella from Umbrella Heaven! 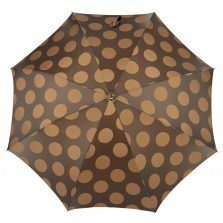 Ezpeleta 2 Tone Striped Double Sided Umbrella. Choice of 2 designs. Double canopy. Stylish and arty crook handle. Auto-open. Totally windproof. 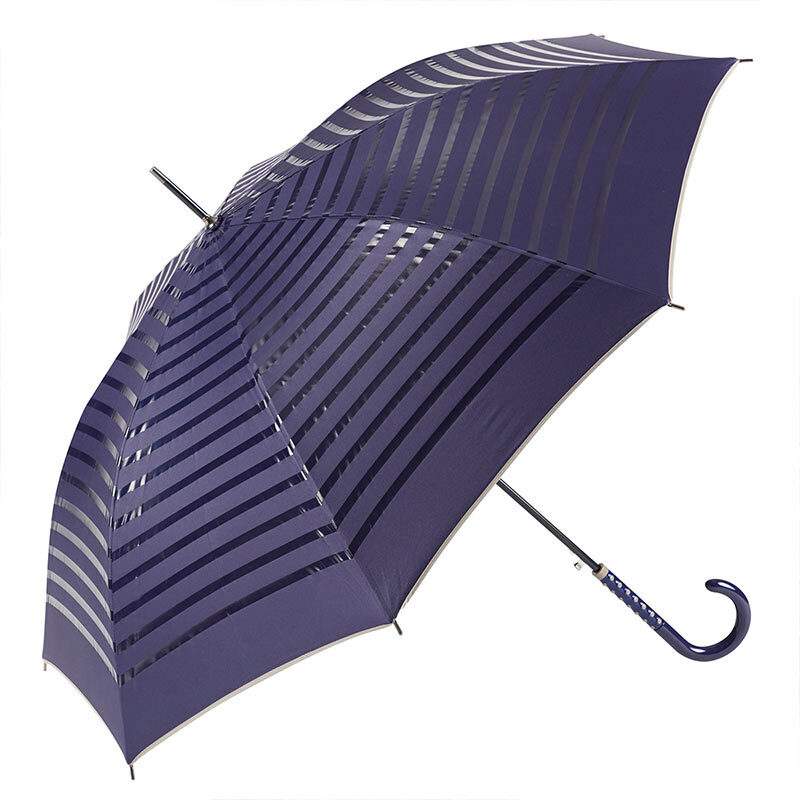 Our Ezpeleta 2 Tone Striped Double Sided Umbrella is quite simply one of the most stylish designer umbrellas you’ll find. In a word, class! 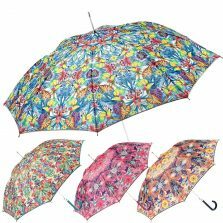 This is an automatic opening double sided umbrella. This means it has two canopy covers. An outer canopy and a separate inner canopy give improved performance in rain, sun and wind. There are two different designs. Navy blue with antique gold. And navy blue with silver grey trim and details. Just select from the Style Options drop down menu above. 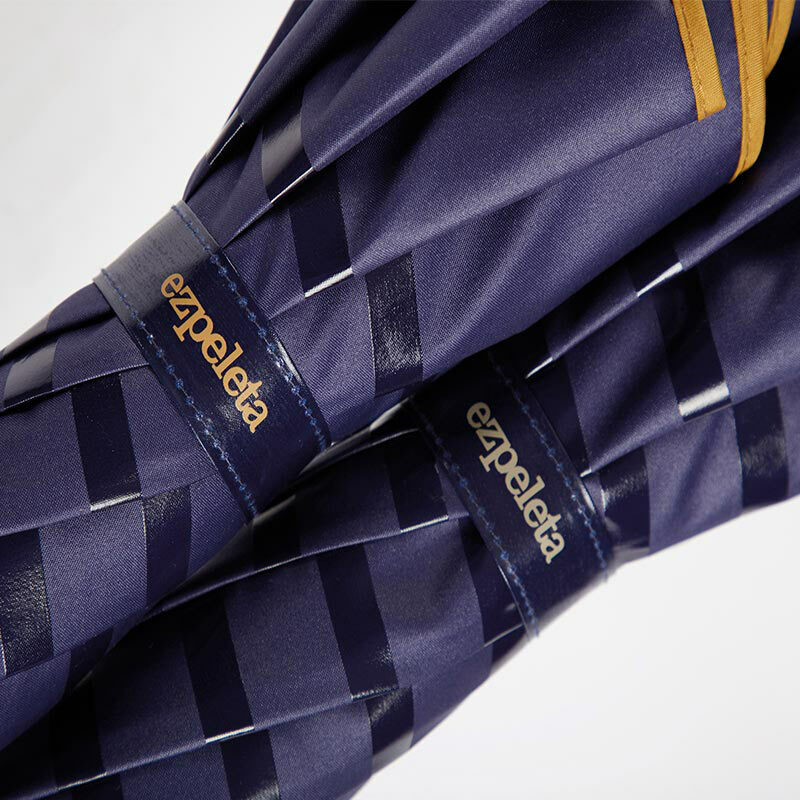 Both Ezpeleta 2 tone striped double sided umbrellas share the same outer canopy design. French navy blue with horizontal gloss navy stripes giving a classy 2 tone appearance as the light reflects off the canopy surface. Classic Ezpeleta fashion umbrella style and flair! But then there are two choices. 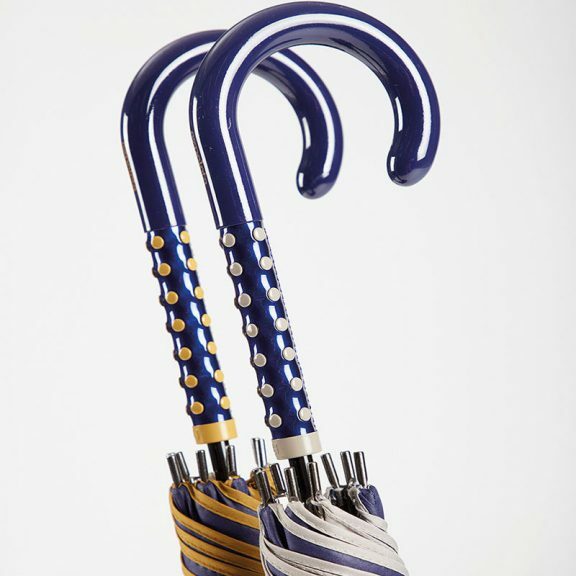 Option 1 is the antique gold trim, antique gold inner lining with antique gold detailed navy blue crook handle. Option 2 is the silver grey trim, silver grey inner lining with silver grey detailing on the navy blue crook handle. The choice is yours. The moulded colour coded crook handle is subtly branded with the ezpeleta marque. The spots on the handle are raised, thus providing a tactile and comfortable grip. 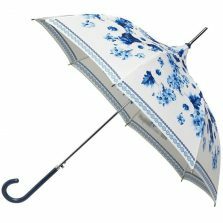 There’s nothing fancy or complicated about this umbrella. It’s design is simple and elegant. 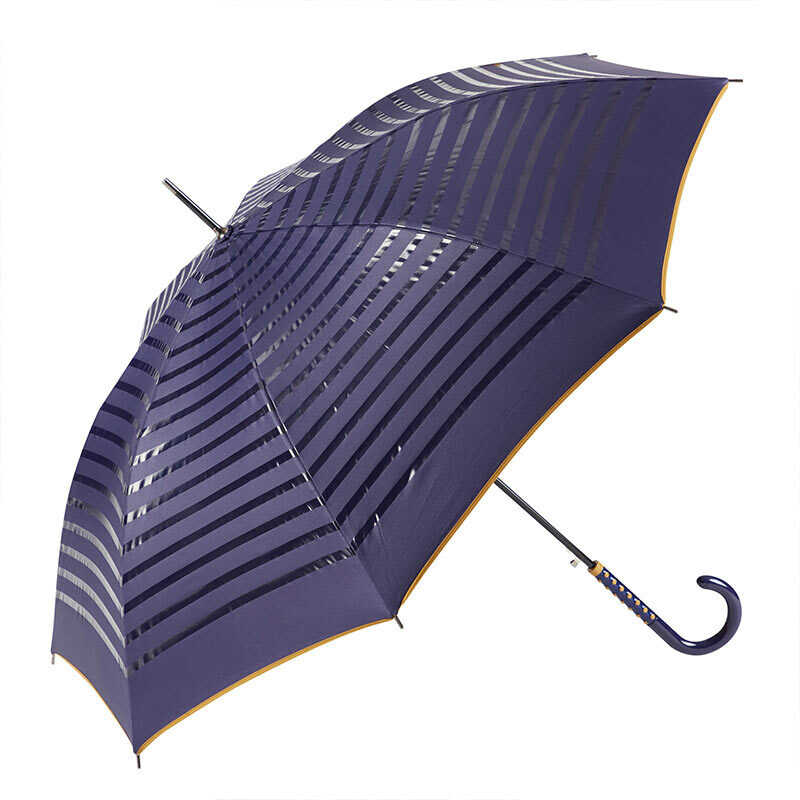 What’s more the Ezpeleta 2 tone striped double sided umbrella also incorporates a modern windproof fibreglass rib structure. It has a black coated steel shaft with an auto-open push button release mechanism. And those subtle finishing design touches include a pewter tipped end spike with matching pewter coloured spoke tips. It’s the small details that just shout out quality. For example, the colour coordinated press stud fastener on the tie wrap. A tiny detail but important. Moreover, the tie wrap feels silky to touch. As do the shiny stripes on the outer surface of the canopy. There’s something quite tactile about the different materials. 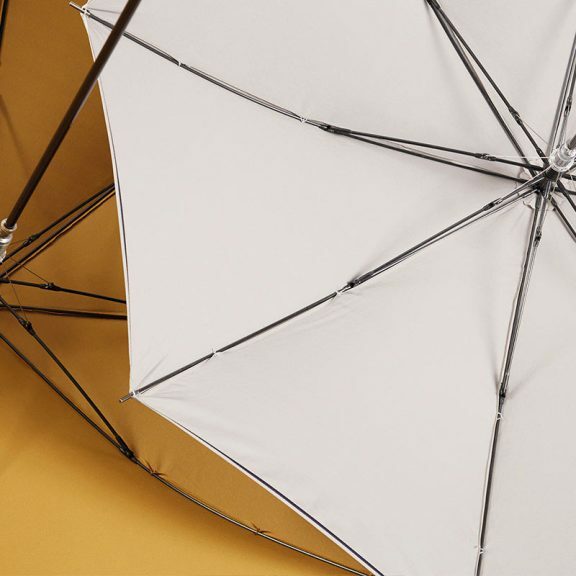 All in all, if you’re looking to treat yourself to a very special designer umbrella, this Ezpeleta 2 tone double sided umbrella is certain to impress! Has to be seen to be believed (and touched to be appreciated). 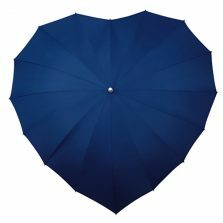 Click to view more beautiful ladies umbrellas or see our Ezpeleta fashion umbrella range!